What is the Florida School Nutrition Association? We are an association of School Food Service (SFS) and Nutrition professionals -- employees, managers, supervisors, directors, and educators -- who work towards promoting the optimal health, nutrition, and education of all children. We support nutritionally adequate and educationally sound, financially accountable, nonprofit child nutrition and school community nutrition programs. No really...what's in it for you? Stay up-to-date with what's happening around the state and across the country regarding school food service and nutrition. See job postings and be the first to know when registrations open and deadlines approach for various FSNA events/activities. FSNA currently offers four statewide conferences a year. These conferences exist to help school food service attendees work towards their SNA CEUs and USDA Professional Standards, advocate for school food at the state level, bring industry partners and school food service employees together, provide networking opportunities, and develop leaders. Why pay more for these conferences? 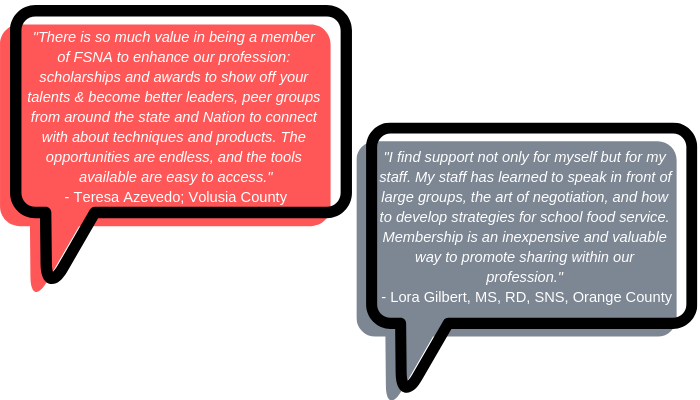 As an active member, you'll receive discounts greater than the FSNA membership dues! FSNA members are eligible to receive many different scholarships, grants, and awards through the FSNA Scholarships & Awards program. Check out the "Scholarships & Awards" webpage for more details. Members have the opportunity to fill various leadership and volunteer roles in their local chapters as well as on the state level. Grow professionally through these service opportunities and give back to your association! BIG Savings through Tickets at Work! As an active member enjoy discounts to Walt Disney World, Disneyland, Universal Orlando, Seaworld, Busch Gardens, Cirque Du Soleil, Six Flags, and many, many more! Click here to view these discounts!